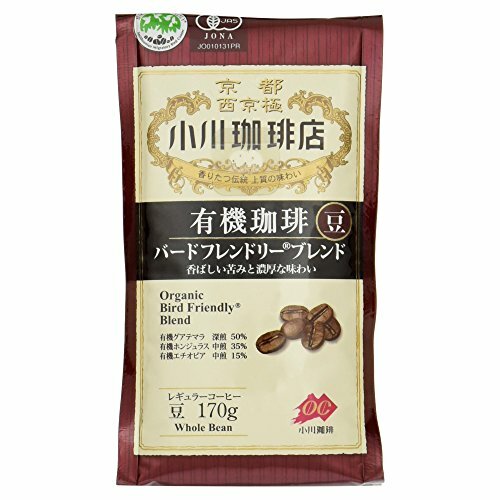 Ogawa Coffee shop organic coffee Bird-friendly blend beans 170g by Ogawa Coffee at Rat Coffee Shop. MPN: E531117H. Hurry! Limited time offer. Offer valid only while supplies last. Ogawa Coffee was founded in 1952. In raised trained in the tradition of Kyoto harsh taste, we have received your support from people who love coffee. Ogawa Coffee was founded in 1952. In raised trained in the tradition of Kyoto harsh taste, we have received your support from people who love coffee. Born from the craftsmanship uncompromising, please enjoy the taste and aroma that is polished. Sinceitsfoundationin1952, is the authentication OGAWACOFFEEhasgrownupinthestrictculinarycultureofKyotowiththespiritofcoffeeartisans.Pleaseenjoyourcoffee'saccomplishedtasteandflavor.? Bird Friendly (R) authentication coffee ?Smithsonian Migratory Bird Center is given to coffee that has been cultivated with consideration to the natural environment. By traditional cultivation method using the shade of tropical forests, coffee is ripening slowly sweetness and umami, the trees will be resting place for migratory birds. Part of the proceeds of the goods will be used as working capital of migratory birds protection activities around the world. After Mix process: In order to maximize the properties of taste, after roasting to fit the conditions of each of the coffee beans are blended. To release special valve gas of ?special valved packaging? package front, to prevent outside air from entering, and keeps the coffee flavor. Bag you may expand or contract under the influence of gas and temperature generated from coffee, but no problem in quality. ?How to use? per per capita (cup 120cc), of 7 ~ 10g coffee (powder) is an appropriate amount. Amount of coffee, please increase or decrease to your liking. Coffee maker, siphon, paper filter, making it ideal for any of the instrument. If you have any questions about this product by Ogawa Coffee, contact us by completing and submitting the form below. If you are looking for a specif part number, please include it with your message.